Built to a high standard in 2006 and being very well presented throughout is this spacious 2 bedroom end of terrace house, situated in a Cul-De-Sac location that is handy for all local amenities and that has a level and enclosed, corner plot garden. This gas centrally heated and uPVC double glazed property comprises, on the ground floor of a useful cloakroom/WC and an open plan living room, dining room and kitchen that has a modern fitted kitchen. On the first floor are the 2 good sized bedrooms (one with 2 x double wardrobes) and a bathroom with a shower over the bath. 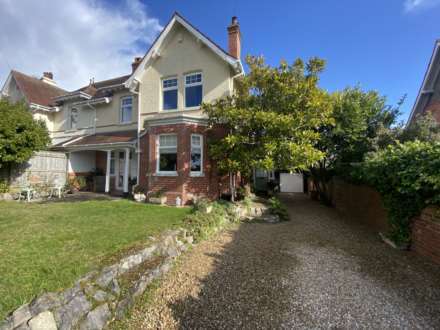 There are level and enclosed corner plot gardens and a driveway that provides an off road parking space, located immediately to the rear of the property. This would, perhaps, make an ideal first time buy or investment purchase and an early appointment to view is strongly advised. Modern white suite comprising low level WC and pedestal wash hand basin. Radiator. Extractor fan. Dual aspect having window to rear and double glazed sliding patio doors to side. Good range of modern matching wall and floor mounted cupboard and drawer storage units with roll edged work surfaces and tiled splash backs. Stainless steel 1½ bowl sink and single drainer unit with mixer tap. Gas cooker point with a filter hood above. Space and plumbing for dishwasher and washing machine. Further space for free standing fridge / freezer etc. Concealed, wall mounted, gas fired combi boiler supplying the central heating and domestic water. Radiator. Laminate flooring. Inset ceiling lights. Window to rear. Radiator. Telephone point. Window to front. Radiator. 2 x Built in double wardrobes. Obscure glazed window to rear. White suite comprising panelled bath with thermostatically controlled shower unit over, tiled to ceiling height. Low level WC. Pedestal wash hand basin. Radiator. Extractor fan. Inset ceiling lights. A feature of the property are the level, enclosed and private corner plot gardens that are laid mainly to lawn and that enjoy a good degree of privacy from an evergreen screen. There is a patio area laid adjacent to the dining area patio doors with outside security lighting, providing an ideal area for outdoor dining and sitting during fine weather. Outside meter boxes. 2 garden sheds, 1 having power connected. Outside water tap. Pedestrian access to front and rear via timber garden gates, with the rear garden gate giving access to the driveway which allows parking for 1 motor vehicle. From Exmouth town centre, proceed onto Salterton Road and turn left at the first set of traffic lights signposted Exeter. Proceed down the hill having Phear Park on your right hand side and turn right at the mini roundabout. Proceed straight ahead at the second mini roundabout into Withycombe Village Road. At the double roundabout at the end of Withycombe Village Road, turn right, then left into St Johns Road. Take the second left into Churchill Road and second left again into Fraser Road. Mount Batten Close is the first road on the right with the property being found in the top left corner, clearly identified by our For Sale board.